Following the death of both her parents, Mary Yellan has no choice but to go and live with her mother’s sister. Aunt Patience lives on the other side of Cornwall, a decidedly less sun-swept frontier of rainy moorland and ragged coastlines. Mary isn’t at all prepared for what she will find at Patience’s home, the remote travellers’ rest, Jamaica Inn. But it is Patience’s husband, the wild Joss Merlyn, who really proves a shock. 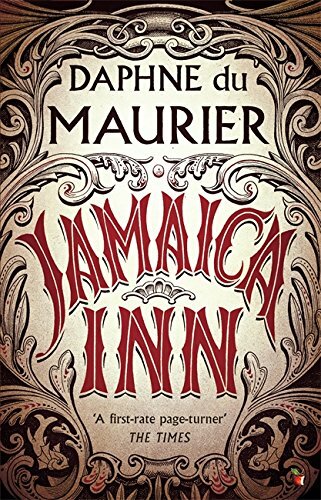 Trapped by distance and violent threats from the raving Merlyn, Mary soon learns the real reason why Jamaica Inn never seems to have any overnight guests. Those who do come show up in the middle of the night, and they are just as wild as her uncle. She knows better to ask any questions, but in his drunken delirium one day, Merlyn tells her the truth – Jamaica Inn is the staging post for wreckers who work the northern Cornish coasts, drawing ships onto the rocks to steal the cargo. Mary wants to leave, but there is nowhere to go, and Aunt Patience is too much of a wreck to be abandoned. Hope comes in an unlikely form, Joss Merlyn’s younger sibling Jem, but Mary isn’t altogether sure he is any less dangerous than his brother. I never really got on with Wuthering Heights, perhaps the most unconvincing of all (supposed) love stories, but fortunately Daphne du Maurier only layers on the Gothic colours (so grey, brown, black, another shade of grey, then) to pastiche them. Indeed, during her coach ride across the stormy moors which opens the novel, Mary’s preoccupation is not the wild gloominess of the world, but the fact that the roof is leaking and she doesn’t want to get wet. The wild men of the novel are not irredeemable boors of the Heathcliff variety either, with Joss Merlyn every bit as much of a cartoon villain as Robert Louis Stevenson’s Long John Silver, and his brother Jem more of a misunderstood outcast whose redemption is clearly signposted from the start, and who, with a change of clothes and a wash, could walk quite easily into an angsty YA novel. Ultimately du Maurier’s sensibilities are more 1930s than 1830s, especially with regard to Mary being an independent character who can spend most of the novel scared without ever verging on hysteria and needing a man’s arms to faint into. And in a thrilling romp full of larger than life men (and not just the Merlyn brothers), that’s exactly what’s needed.